It’s been quite the year for State Representative Heath Clark (R-Warner Robins). You see, Rep. Clark has voted not once, not twice, not three times, but four times for major tax hikes in just the last month! This onerous tax will cost Georgians $300 MILLION per year, driving up medical costs across the state. Rep. Clark’s second major tax hike vote of the year was to pass H.B. 61, the so-called “Internet tax hike and tattletale” bill. This bill will not only raise taxes on Georgians by $274 MILLION per year but will also require businesses to report their own customers to the Georgia Department of Revenue. Speaking of the Internet, one of the fastest growing sections of the economy has been the combination of mobile Internet applications like Uber, Lyft, and Airbnb combined with Georgia entrepreneurs with do-it-yourself attitudes. Sadly, Rep. Clark’s third major tax hike vote of the year, for H.B. 225, was an attack on these Georgia entrepreneurs. Rep. Clark’s next next tax hike vote of the year was to pass H.B. 340, the used car tax hike. This bill will raise taxes on Georgians by $200 MILLION in its first year and rising to $268 MILLION per year by 20225. They say that socialism makes all of us equally poor. Well, the solution to that isn’t to make everyone poorer by raising taxes! The solution is to cut taxes for all businesses and individuals in Georgia. Every two years we survey candidates for state office on issues important to our supporters. *** Repeal Georgia’s Internet tax scheme. Rep. Heath Clark made these promises when he was running for office, and now he has broken all of them in a matter of a month! We have to hold politicians like Rep. Heath Clark accountable to their actions. Your calls, emails, and Facebook posts make a difference. 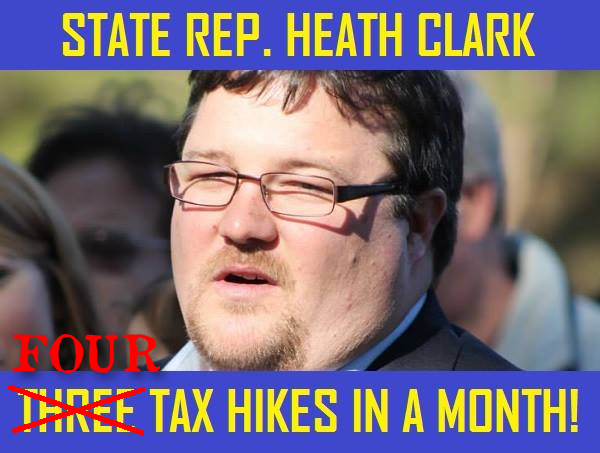 Please let Rep. Heath Clark know that these tax hikes are unacceptable. Let him know that he needs to make a public and sincere apology for betraying his constituents with these tax hike votes. And let him know that you will hold him accountable at the polls should he continue to stab taxpayers like you in the back. And please share this post with as many of your friends and family in the Byron / Centerville / Warner Robins area as possible. 5. Salzer, James. “Bill could mean $200 million tax hike for Georgia used-car buyers.” Atlanta Journal-Constitution March 9, 2017.